There are a number of monitoring solutions for VMware infrastructures – probably 50+. Do you know that only a handful (10%) of them have gone through the rigorous VMware Ready certification process? See the list of VMware Ready Certified management software vendors here. This means if you are choosing a VMware Ready certified product, you are making the right choice – the vendor has taken the time and effort to ensure that their product works best in a VMware vSphere environment, by following best practices and using certified APIs for vSphere. eG Innovations went through the rigorous VMware Ready certification process in early 2009 and achieved our certification by mid 2009. See our joint announcement with VMware here. As i indicated, there are a large number of products that are NOT VMware Ready Certified, to name a few – Netuitive SI for VMware, Liquidware Labs Statusphere, UptimeSoftware Up.Time, Veeam Monitor and Reporter, IBM Tivoli VMware Monitor, Akorri Balance Point, Aternity Frontline, Lakeside, RTO PinPoint, Integrien Alive, NetIQ App Manager, and Solarwinds/Tek-Tools VM Monitor. If you are evaluating monitoring solutions for your VMware/vSphere infrastructures, consider vendors who have taken the time to go through the rigorous certification process from VMware and have ensured that their products work best in such infrastructures! 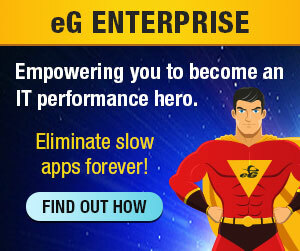 Moreover eG is the only solution which is both VMware and Citrix Ready. With it’s wide support in the virtualized platform (VMware ESX, Citrix XenServer,Solaris Ldoms, Microsoft Hyper-v), eG VM Monitor is a clear winner.